When critical capital equipment wanders off, staff members waste time tracking it down for the next procedure, which takes away from patient care and drives up cost. With AirFinder in place, staff can focus their time where it’s needed—in healing. By using AirFinder RTLS in hospitals and healthcare facilities, you can easily check in on the location of in-demand providers and employees. For example, if nurses need to quickly check-in with the charge nurse, they can quickly and easily locate them. Simplify the tracking and reporting of chain of custody for blood, organs, and surgical equipment that are shipped to and from the hospital for specific procedures. 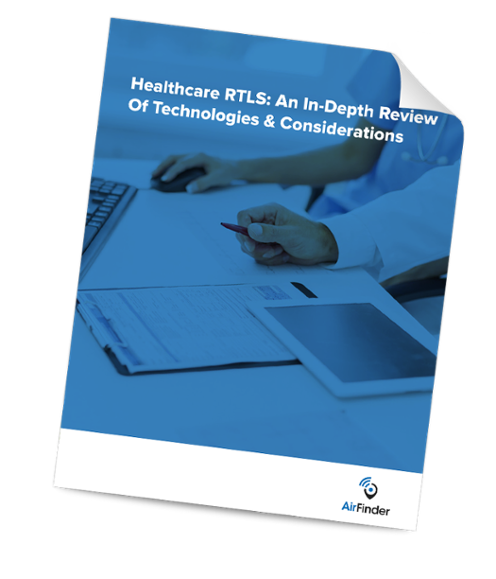 From tracking assets and personnel to managing inventory and remaining compliant, RTLS holds a great deal of untapped value for healthcare organizations. Download the free white paper to learn more. Whether you’re tracking pallets to ensure all of today’s fresh produce leaves the processing plant or tracking and locating a misplaced lot of goods, AirFinder RTLS for manufacturing can help keep your organization’s quality control on par. Using RTLS allows you to view and analyze a new stream of data for inefficiencies. In a process-driven industry like manufacturing, this can make all the difference. From verifying the bulk movement of large lots of cargo to identifying a critical piece of machinery quickly and efficiently at an airport, AirFinder is ideal for locating equipment at various transport hubs. Through the use of AirFinder, you can ensure that temperature-sensitive cargo isn’t moved to a place where it would overheat or spoil. By incorporating AirFinder into ID or visitor badges, you can monitor the whereabouts of employees, third parties, and contractors—and mitigate compromising or hazardous situations. Want to learn more about how AirFinder can lower cost and improve efficiency in your sector?